Hack # 3. 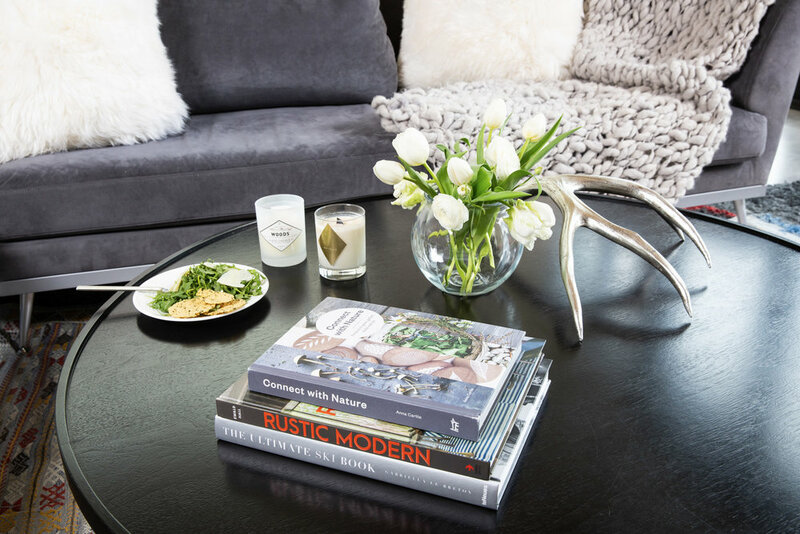 Styling the New West’s living room begins with layering basics. If you aren't using an interior designer or decorator, then these tips will be useful when choosing where to begin. Your living room is the heart of the home. It is where you begin and mostly likely end. In styling, you want to look at a room in layers. Laying a foundation first and then presenting layers that mix nicely. Investing in a sound rug is a must. It will probably be a big chunk of your budget. Your rug ties everything together creating and tightening the area to make it cozy and defining where your eye will travel to. It adds color and texture, two important features in your LOOK. Don't be afraid to think outside a one-color scheme. This will be a trial and error beginning. You aren't married to the rug. Here I have used a Kilim rug speaking mountain modern and a bit western combined with a southwest color combination of grey, light blue, yellow and splash of red. I found mine at Twenty Two Home. Okay, let's get started. Lay it down sister! Defining your space with pillows and a throw. In this mountain modern home, we have a stylish simple sofa to work with giving us lots of options for pillows. Since we have a dark grey sofa, we wanted to lighten it up a bit playing around with textures that are comfortable yet fun visually. These off-white pillows are 25 x 25 in size, and they anchor and brighten our LOOK. They are a mohair quality pillow and I chose to have two to keep to a simple modern feel. You may want to add two other pillows being careful not to over-use this concept. Too many pillows tell your visitors DON'T SIT HERE!! I kept to a light grey throw but added this wonderful texture to the sofa behind the pillows. Here is where you start to see the layers. This throw looks like it was knitted with giant knitting needles and made of a wool blend. It also comes from Twenty Two Home. Being of very cold nature, this throw is not only beautiful but useful. Please don't buy something you don't want someone to actually use. Think through the cashmere, linen and options you have available. Would you use it yourself? 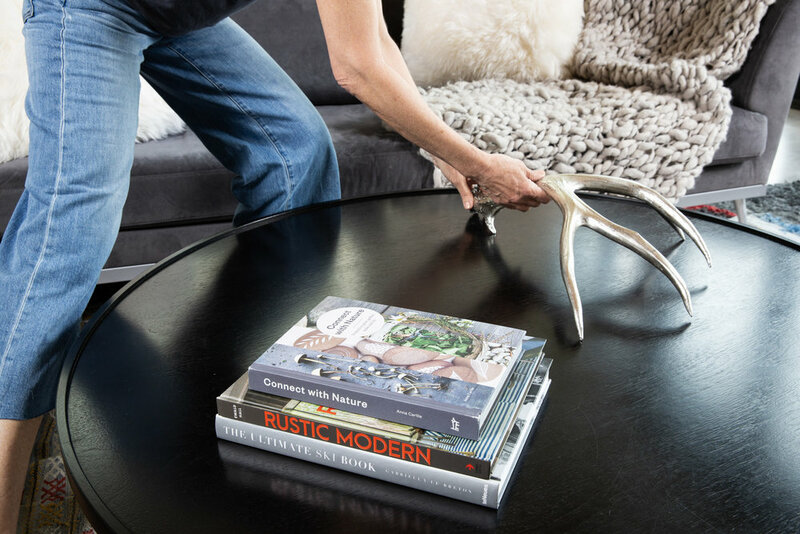 Since we are giving quick and simple tips at styling a living room, we are going to zero in on the coffee table. As you notice we started wide and moving smaller with your detailed items. Keep it clean and functional and most of all pretty!! We've started with our largest items books. I've chosen one oversized book to layer the bottom and moving up to two other books, really similar in size and color scheme. In a previous blog, STYLING TIP. BOOKS. MORE THAN A LOOK., I spoke of choosing books you love and assuming you've done the hard stuff of selecting these particular books, we are ready to style here. Of course, start large and work up to the smaller books. Next I've added the trendy antler with the silver patina. A local JHole artist does a fabulous job of mixing western and mountain modern. It brightens up our table adding interest presenting a true conversation piece. Your last layers. The main rule here is to KEEP IT SIMPLE AND FUNCTIONAL BUT PRETTY. Here you add with your last layers of flowers and candles. Voila! 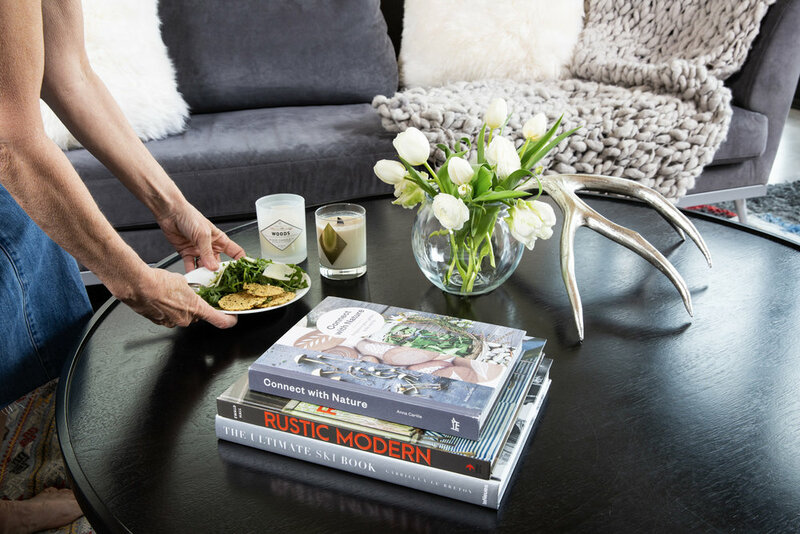 I choose simple white for our color palette to blend nicely with our mountain modern LOOK. I prefer to not have competing colors happening all around. Be mindful of the flowers you choose and even the candle color.